BLOOMINGTON, Ind. 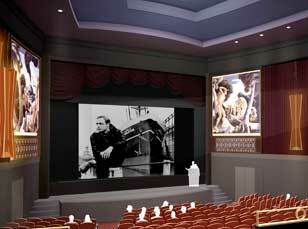 -- A $250,000 gift from philanthropists Jane and Jay Jorgensen will fund a new lecture series at the Indiana University Cinema, which is scheduled to open next month in the building that once housed the University Theatre. The "Jorgensen Guest Filmmaker Lecture Series" will bring renowned filmmakers and industry leaders to the IU Bloomington campus to share their experiences and insights with students and faculty. This spring, the lecture series will feature directors Kenneth Anger (Scorpio Rising), Jill Godmilow (What Farocki Taught), Albert Maysles (Grey Gardens), David Anspaugh (Hoosiers), Stanley Nelson (Freedom Riders) and Peter Bogdanovich (The Last Picture Show). IU's Lilly Library maintains The Peter Bogdanovich Collection, consisting of papers, scripts, films and more. Also on the spring schedule are art director Terence Marsh (The Shawshank Redemption), screenwriter/producer Angelo Pizzo (Hoosiers) and Jonathan Sehring, president of IFC Films. As a token of gratitude for Jorgensen's gifts and in appreciation of their $100,000 donation for the revamped building's new lobby, the IU Cinema has bestowed the "Jorgensen Lobby" on their behalf. The Jorgensens, of Fort Wayne, Ind., have contributed to the IU Foundation regularly through their Ove W. Jorgensen Foundation. The couple's generosity and leadership has been instrumental in the new cinema's development, said Jon Vickers, IU Cinema director. Jane, a 1972 graduate of IU Bloomington, and her husband, Jay, a 1972 graduate of IPFW, have actively promoted the IU Cinema project over the past several years. "The Jorgensen's leadership gift forged a path of confidence for other donors to follow as the IU Cinema project began to take shape," Vickers said. "Jane has taken real ownership in the project. She has done as much as anyone to inform Indiana University alumni and friends across the country about Bloomington's new world-class facility." In recognition of the Jorgensen's previous gifts and in appreciation of their $100,000 donation for the revamped building's new lobby, the IU Cinema has bestowed the "Jorgensen Lobby" on their behalf. Jane Jorgensen's brother, David Anspaugh, directed the classic Indiana-based films Hoosiers and Rudy. "Jane's enthusiasm and passion for the IU Cinema project has been unequalled," Vickers said. "She is full of great ideas for raising funds, building constituencies and promoting awareness for the project." For more information on the IU Cinema and to view a schedule of upcoming performances, see http://www.indiana.edu/~iucinema/.